The regional as well as the international crop production is expected to be influenced by climate change. This study describes an assessment of simulated potential cotton yield using CropSyst, a cropping systems simulation model, in Northern Greece. CropSyst was used under the General Circulation Model CGCM3.1/T63 of the climate change scenario SRES B1 for time periods of climate change 2020-2050 and 2070-2100 for two planting dates. Additionally, an appraisal of the relationship between climate variables, potential evapotranspiration and cotton yield was done based on regression models. Multiple linear regression models based on climate variables and potential evapotranspiration could be used as a simple tool for the prediction of crop yield changes in response to climate change in the future. The CropSyst simulation under SRES B1, resulted in an increase by 6% for the period 2020-2050 and a decrease by about 15% in cotton yield for 2070-2100. For the earlier planting date a higher increase and a slighter reduction was observed in cotton yield for 2020-2050 and 2070-2100, respectively. The results indicate that alteration of crop management practices, such as changing the planting date could be used as potential adaptation measures to address the impacts of climate change on cotton production. IPCC, 2013. Climate Change 2013: The physical science basis. Contribution of Working Group I to the Fifth Assessment Report of the Intergovernmental Panel on Climate Change, T.F. Stocker et al. (eds), Cambridge University Press, Cambridge, United Kingdom and New York, NY, USA. p. 1535. IPCC, 2007. Climate change 2007: Impacts, adaptation and vulnerability. Contribution of Working Group II to the Fourth Assessment Report of the Intergovernmental Panel on Climate Change, M.L. Parry et al. (eds). Cambridge University Press, Cambridge, UK, p. 976. Rosenzweig, C., Allen, L.H., Harper, L.A., Hollinger, S.E. and Jones, J.W., 1995. Climate Change and Agriculture: Analysis of Potential International Impacts. ASA Special Publication No. 59. ASA, Madison, WI. Rosenzweig, C. and Hillel, D., 1998. Climate Change and the Global Harvest: Potential Impacts of the Greenhouse Effect on Agriculture. Oxford University Press, New York. Abraha, M.G. and Savage M.J., 2006. Potential impacts of climate change on the grain yield of maize for the midlands of KwaZulu-Natal, South Africa. Agriculture, Ecosystems & Environment, 115. 150-160. Kimball, B.A. 1983. Carbon dioxide and agricultural yield: an assemblage and analysis of 430 prior observations. Agronomy Journal, 75. 779-788. European Commission, 2013. Cotton, Agricultural and Rural Development. http://ec.europa.eu/agriculture/cotton/index_en.htm. Yoon, S.T., Hoogenboom, G., Flitcroft, I. and Bannayana, M., 2009. Growth and development of cotton (Gossypium hirsutum L.) in response to CO2 enrichment under two different temperature regimes. Environmental and Experimental Botany, 67. 178-187. Bange, M.P., McRae, D. and G. Roth, G., 2008. Cotton. An overview of climate change adaptation in the Australian agricultural sector-impacts, options and priorities, C.J. Stokes et al. (eds). CSIRO, 71-95. Karamanos, A., Skourtos, M., Voloudakis, D., Kontogianni, A. and Machleras, A., 2011. Impacts of climate change on agriculture. The environmental, economic and social impacts of climate change in Greece, C. Zerefos et al. (eds), Climate Change Study Committee, Bank of Greece, Greece, p. 186-196. Voloudakis, D., Karamanos, A., Economou, G., Kalivas, D., Vahamidis, P., Kotoulas, V., Kapsomenakis, J. and Zerefos, C., 2014. Prediction of climate change impacts on cotton yields in Greece under eight climatic models using the AquaCrop crop simulation model and discriminant function analysis. Agricultural Water Management, 147. 116-128. Pereira, L.S. 2011. Challenges on water resources management when searching for sustainable adaptation to climate change focusing agriculture. European Water, 34. 41-54. Uehara, G. and Tsuji, G.Y., 1998. Overview of IBSNAT. Understanding Options for Agricultural Production, G.Y. Tsuji, G. Hoogenboom and P.K. Thornton (eds), Kluwer Academic, Dordrecht, The Netherlands, 1-7. Stöckle, C.O. and Nelson, R.L., 2003. Cropping Systems Simulation Model User’s Manual. Biological Systems Engineering, Washington State University, Pullman, WA. Stöckle, C.O., Donatelli, M. and Nelson, R.L., 2003. CropSyst: A cropping systems simulation model. European Journal of Agronomy, 18. 289-307. Stöckle, C.O. 1996. GIS and simulation technologies for assessing cropping systems management in dry environments. 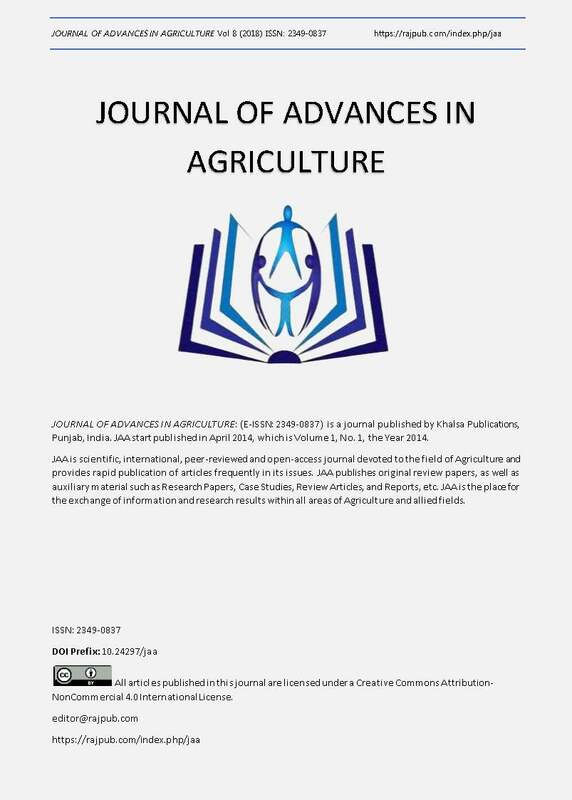 American Journal of Alternative Agriculture, 11. 115-120. Badini, O., Stöckle, C.O., Jones, J.W., Nelson, R., Kodio, A. and Keita, M., 2007. A simulation-based analysis of productivity and soil carbon in response to time-controlled rotational grazing in the West African Sahel region. Agricultural Systems, 94. 87-96. Rivington, M., Matthews, K.B., Bellocchi, G. and Buchan, K., 2006. Evaluating uncertainty introduced to process-based simulation model estimates by alternative sources of meteorological data. Agricultural Systems, 88. 451-471. Moriondo, M., Maselli, F. and Bindi, M., 2007. A simple model of regional wheat yield based on NDVI data. European Journal of Agronomy, 26. 266-274. Tubiello, F.N., Donatelli, M., Rosenzweig, C. and Stöckle, C.O.,. 2000. Effects of climate change and elevated CO2 on cropping systems: model predictions at two Italian locations. European Journal of Agronomy, 13. 179-189. Donatelli, M., Tubiello, F.N., Peruch, U. and Rosenzweig, C., 2003. Impacts of climate change and elevated CO2 on sugar beet production in northern and central Italy. Italian Journal of Agronomy, 6. 133-142. Zhao, J., Guo J. and Mu. J., 2015. Exploring the relationships between climatic variables and climate-induced yield of spring maize in Northeast China. Agriculture, Ecosystems & Environment, 207. 79-90. Isik, M. and Devadoss, S., 2006. An analysis of the impact of climate change on crop yields and yield variability. Applied Economics, 38. 835-844. Lobell, D.B. and Field, C.B., 2007. Global scale climate-crop yield relationships and the impacts of recent warming. Environmental Research Letters, 2(1). 1-7. Boubacar, I. 2010. The effects of drought on crop yields and yield variability in Sahel. The Southern Agricultural Economics Association Annual Meeting, The Southern Agricultural Economics Association, Orlando, FL. Ouda, S.A., Khalil, F.A. and Yousef. H., 2009. Using adaptation strategies to increase water use efficiency for maize under climate change conditions. 13th International Water Technology Conference, 12-15 March 2009, Hurghada, Egypt. Torriani, D.S., Calanca, P., Schmid, S., Beniston, M. and Fuhrer, J., 2007. Potential effects of changes in mean climate and climate variability on the yield of winter and spring crops in Switzerland. Climate Research, 34. 59-69. IPPC, 2000. Special report on emissions scenarios. A special report of Working Group III of the Intergovernmental Panel on Climate Change, N. Nakicenovic et al. (eds). Cambridge University Press, Cambridge, UK, p. 599. Flato, G., Boer, G.J., Lee, W.G., McFarlane, N.A., Ramsden, D., Reader, M.C. and Weaver, A.J., 2000. The Canadian centre for climate modelling and analysis global coupled model and its climate. Climate Dynamics, 16. 451-468. Richardson, C.W. 1985. Weather simulation for crop management models. Transaction of the ASAE, 28(5). 1602-1606. Annandale, J.G., Jovanovic, N.J., Benade, N. and Tanner, P.D., 1999. Modelling the long term effect of irrigation with gypsiferous water on soil and water resources. Agriculture, Ecosystems & Environment, 76. 109-119. Georgiou, P.E. and Papamichail, D.M., 2008. Optimization model of an irrigation reservoir for water allocation and crop planting under various weather conditions. Irrigation Science, 7. 85-95. Stöckle, C.O. and Nelson, R.L., 1999. ClimGen: A Weather Generator Program. Biological Systems Engineering Department, Washington State University, Pullman, WA. Stöckle, C.O., Martin, S. and Campbell, G.S., 1994. CropSyst: A cropping systems model: water/nitrogen budgets and crop yield. Agricultural Systems, 46. 335-359. Sommer, R., Kienzler, K., Conrad, Ch., Ibragimov, N., Lamers, J., Martius, Ch. and Vlek, P.,. 2008. Evaluation of the CropSyst model for simulating the potential yield of cotton. Agronomy for Sustainable Development, 28(2). 345-354. Kumawat, A., Kumar, R., Nangia, V., Rathore, V.S., Yadava, N.D., Yadav, R.S., Soni, M.L. and Ram Jat, S., 2014. Evaluation of CropSyst model for yield and water productivity of Bt cotton. Bioved, 25(1). 59-65. Fang, S.B. 2011. Exploration of method discrimination between trend crop yield and climatic fluctuant yield. Journal of Natural Disasters, 6. 13-18. EI-Maayar, M. and Lange, M.A., 2013. A methodology to infer crop yield response to climate variability and change using long-term observations. Atmosphere, 4. 365-382. Martinec, J. and Rango, A., 1989. Merits of statistical criteria for the performance of hydrological models. Water Resources Bulletin, 25(2). 421-432. Papamichail, D.M. and Papazafiriou, Z.G., 1992. Multiple input - single output linear functional models for river flow routing. Journal of Hydrology, 133. 365-37. Krause, P., Boyle D.P. and Bäse, F., 2005. Comparison of different efficiency criteria for hydrological model assessment. Advanced Geosciences, 5. 89-97. Wang, M., Li, Y., Ye, W., Bornman, J.F. and Yan, X.I., 2011. Effects of climate change on maize production and potential adaptation measures: A case study in Jilin Province, China. Climate Research, 46. 223-242.